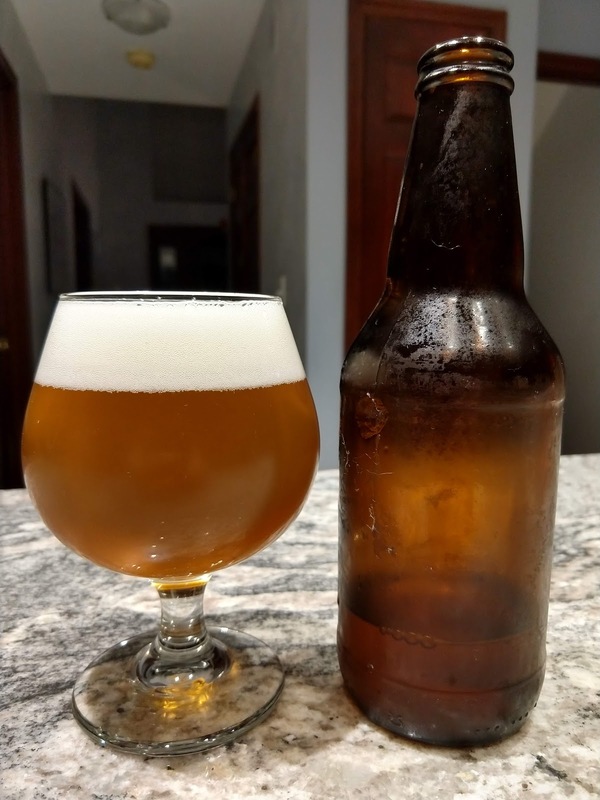 Some time ago, when searching for some good recipes, I found a Centennial Blonde Ale recipe that had been voted the top recipe by visitors to HomeBrewTalk.com. I've wanted to brew it for a while, and finally got around to doing it today. For a mash schedule, I've modified the High-Efficiency Mash Schedule in the Zymatic Recipe Crafter to hold the mash at 150F for 90 minutes, followed by 30 minutes at 154F, leaving the rest the same. As is my usual process, the beer will be pumped into a sanitized kettle after brewing, the sanitized immersion chiller dropped into it, and the beer chilled to a yeast-safe temperature. The beer will then be transferred to a sanitized fermenter, yeast and Clarity Ferm added, and a Tilt Hydrometer dropped into it for monitoring purposes. 06/24/2018: The beer came up slightly low in volume and slightly high in gravity. I decided to ignore the 3-point difference in SG and the quart of volume to avoid possibly over-diluting the beer, especially given that 3 points of gravity may well be within a reasonable margin of error. The refractometer measured gravity at 10.9 Brix, which (when calibrated) works out to 1.045 SG which also is close to the 1.043 SG that the Tilt Hydrometer measured. This works out to a Brew House Efficiency of 72.1% for this batch. The Nottingham yeast and Clarity Ferm were pitched into the 76F wort before the fermenter was sealed. Since the Notthingham yeast prefers cooler temperatures for fermentation, I decided to see if I could chill the beer a bit further. I wrapped some ice packs used for a cooler around the fermenter, along with a damp towel. Within an hour the fermenter temperature dropped to 70F and as of this writing is continuing to drop. The ambient 68F temperature in the basement should help to keep the fermentation temperature down a little, but I'll have to keep an eye on it. 06/25/2018: The ice packs and damp towel got the beer down to around 69F by morning. I replaced the thin ice packs with some thicker ones used for shipping food at around 7:30am. By 11:30am, the temperature in the fermenter had dropped to about 66F. The temperature has held there since then, though I've replaced the ice packs in the meantime. The gravity has dropped from the original 1.043 SG down to its current 1.014 SG. That's about 67.4% attenuation and 3.8% ABV in about 24 hours. If the yeast continues working at this rate, it should hit the expected final gravity of 1.010 SG by this time tomorrow night. 06/26/2018: The beer's gravity has been holding steadily at 1.008 SG now for about eight hours now. That's 81.4% attenuation and 4.6% ABV. That's a bit more than expected, but not too far out of line. 06/27/2018: The gravity continues to hold steady at 1.008 SG, so it appears that primary fermentation is complete. I'll give it another day or two to ensure it's really finished, then treat it with gelatin finings and cold crash it. 06/30/2018: The gravity has dropped slightly to 1.007 SG, and has been holding there for about two days now. 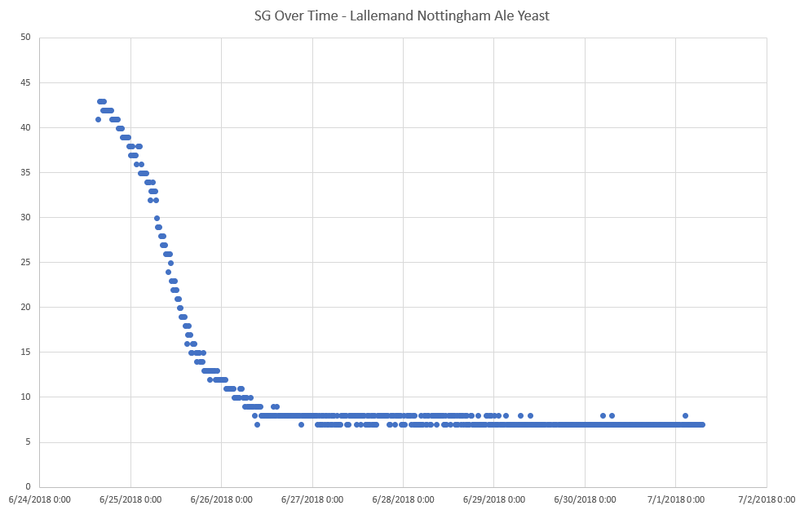 07/01/2018: The scatter plot below shows the gravity of the beer from the time the yeast was pitched until now. Each dot represents a gravity reading at 15 minute intervals. The yeast seemed to begin fermenting around 3 hours after pitching. It seemed to peak around 15-24 hours after pitching, and had substantially completed fermentation by about 4-5 days. A teaspoon of gelatin was bloomed in distilled water and heated to 155-160F before adding to the fermenter. The fermenter was then placed in a mini-fridge to cold crash and clear up before bottling. 07/05/2018: The beer is looking pretty clear, and I needed to free up the mini-fridge for the Cream Ale that's right behind it (process-wise), so I bottled the beer today using 4 small carbonation drops per bottle (medium carbonation). Yield was 23 bottles with virtually no extra beer. The yeast was compacted nicely in the bottom of the fermenter. The Tilt registered 1.005 SG at bottling and 38F. Although I'll reserve judgment until the beer finishes conditioning, a sample of the small amount of leftover beer seemed merely "OK" and not particularly tasty (or particularly bad) to me. 07/15/2018: The beer has carbonated nicely and was removed from the 76F hotbox in preparation for labeling and sharing with others. 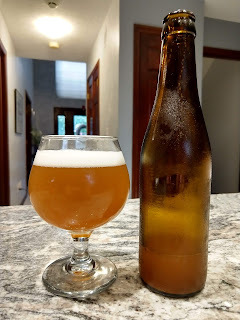 Despite having had a Belgian Tripel take fourth place at the Ohio State Fair this year, I've still never really made one that I felt was "perfect" for my taste. I decided before brewing another that I'd study the style a bit, seeing what has worked for other brewers, and try to come up with my own recipe. 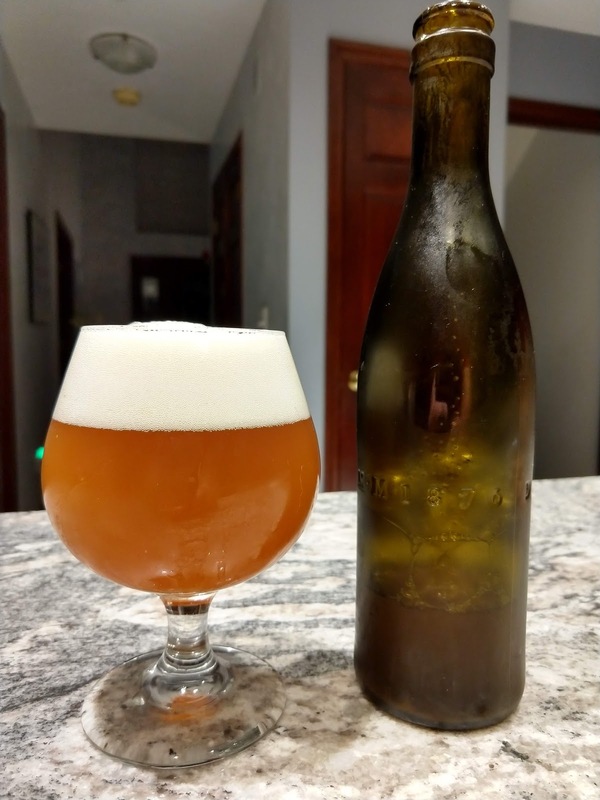 I located as many Tripel recipes on the web as I could. 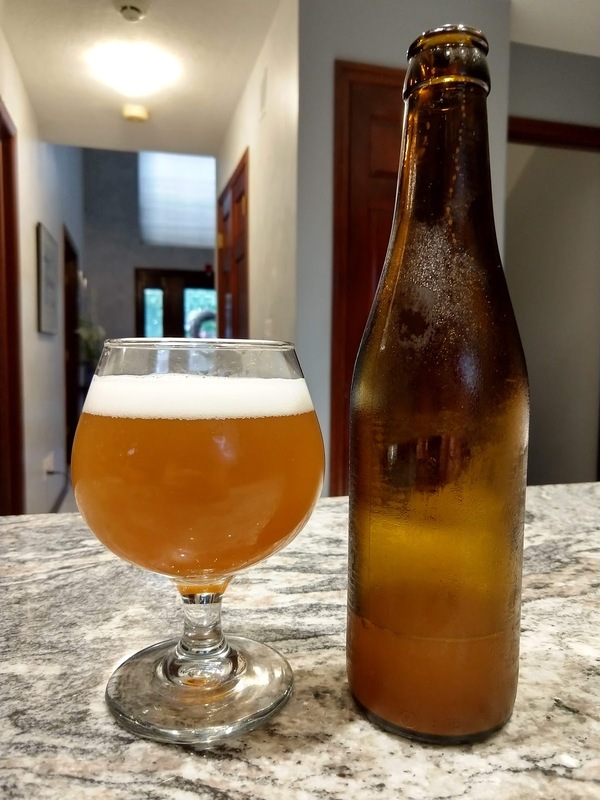 If the recipe was for a commercial Tripel, a commercially sold kit, published in a magazine, or listed as a winner in a home brewing contest, then I included it in the study. There are many (possibly very good) Tripel recipes listed on the web that don't have a "track record" (for lack of a better phrase) associated with them. I did not include those. Aroma: Complex bouquet with moderate to significant spiciness, moderate fruity esters and low alcohol and hop phenols. Esters are reminiscent of citrus fruits such as oranges, but may sometimes have a slight banana character. A low yet distinctive spicy, floral, and sometimes perfumy hop character is usually found. Alcohols are soft, spicy, and low in intensity. The malt character is light, with a soft, slightly grainy-sweet or slightly honey-like impression. The best examples have a seamless, harmonious interplay between the yeast character, hops, malt, and alcohol. Flavor: Marriage of spicy, fruity, and alcohol flavors supported by a soft, rounded grainy-sweet malt impression, occasionally with a very light honey note. Low to moderate phenols are peppery in character. Esters are reminiscent of citrus fruit such as orange or sometimes lemon, and are low to moderate. A low to moderate spicy hop character is usually found. Alcohols are soft, spicy, and low in intensity. Bitterness is typically medium to high from a combination of hop bitterness and yeast-produced phenolics. Substantial carbonation and bitterness lends a dry finish with a moderately bitter aftertaste with substantial spicy-fruity yeast character. The grainy-sweet malt flavor does not imply any residual sweetness. Characteristic Ingredients: Pilsner malt, typically with pale sugar adjuncts. Saazer-type or Styrian Goldings are commonly used. Belgian yeast strains are used - those that produce fruity esters, spicy phenolics and higher alcohols - often aided by slightly warmer fermentation temperatures. Spice additions are generally not traditional, and if used, should be a background character only. Fairly soft water. My personal favorite examples include: Karmeliet Tripel, Unibroue La Fin Du Monde, and Old Dominion's Candi Belgian Tripel. Appearance: Anything in the yellow to gold color range, consistent with the BJCP style. A thick white long-lasting head. This (for me) means including both Melanoidin and Carapils malts in grain bill, as that combo tends to produce the kind of head I'm looking for. Aroma: Spicy, fruity, and with a definite orange/lemon citrus note. Optionally a hint of honey and malt sweetness. Mouthfeel: Medium body with lots of carbonation. Flavor: Mild peppery spiciness, citrus notes, spicy hop character that's allowing the balance to tilt just a little toward the malt sweetness (which goes against the dry/bitter nature of the style). A hint of honey. No warming note. I don't want the spices to be obvious, nor do I want it so sweet that it feels like a soft drink. Any Tripel I produce that doesn't meet those criteria will require changes. Acidulated Malt: Primarily used to lower pH in the wort when Pilsner malt is used. Aromatic Malt: Said to provide sweet, toasted flavors and contribute light brown and orange color along with intensely malty flavor. Belgian Cara 8: A very pale caramel malt said to contribute a subtle caramel flavor. Belgian Pale Malt: A fully modified pale ale malt, good as a base malt. Biscuit Malt: A lightly toasted malt that contributes warm, earthy malt flavors and aromas. Contributes light to medium garnet brown colors and a toasty finish. Some nutty flavors and a baking bread aroma. Caramel 10L Malt: This light caramel malt reportedly delivers a mellow candy-like sweetness and subtle toffee flavor, and increases foam stability. Carapils/Dextrine Malt: Contributes unfermentable sugars that add foam stability and fullness to a beer. Caravienne Malt: Adds subtle toffee, caramel, and malty flavors to the beer. Flaked Corn: Adds a mild neutral flavor when used in small amounts, and a moderate sweetness when used in larger amounts. Flaked Wheat: Increases head retention and body. Melanoidin Malt: Adds a red color and intensifies malt flavor and aroma. (Belgian and Non-Belgian) Munich Malt: A bready, sweet malt. (Belgian and non-Belgian) Pilsner Malt: A light colored base malt. Torrified Wheat: A whole kernel version of flaked wheat, which increases head retention and body. Victory Malt: A Biscuit-style malt that brings out nutty, toasty, biscuit-like flavors. Adds a layer of dry toasted complexity and a russet brown color. Wheat Malt: Improves head retention and mouth feel. This is not to say that other grains cannot be used, only that these are common. I'm also not suggesting that a Tripel recipe should have all, or even most, of these grains it... only that these are being used and are worth considering in a recipe because they've obviously worked in the past. A good Tripel recipe probably mixes those five categories to some degree. Crystal: An aroma hop, said to impart woody, fruity, and "green" aromas. Czech Saaz: An aroma hop, said to import mild earthy, herbal, and floral overtones. East Kent Goldings: A dual-purpose hop said to include floral, lavender, spice, honey, earthy, lemony, orange, grapefruit, and thyme overtones. Fuggle: An aroma hop said to include delicate and pleasant mint, grass, and floral tones. Hallertau Mittelfruh: An aroma hop said to impart noble, earthy, and herbal tones. Horizon: A dual-purpose hop said to provide smooth bitterness and impart floral bouquet and spicy aromas to a beer. Liberty: An aroma hop said to impart noble, delicate, floral bouquet, and spice aromas. Nugget: A bittering hop said to have mild herbal aromas. Sterling: An aroma hop said to produce noble and spicy aromas. Styrian Goldings: Said to impart a spicy aroma with a sweet/earthy edge, resinous with hints of white pepper. Target: A dual purpose hop said to impart aromas of fresh green sage, spicy/peppery notes, and hints of citrus marmalade. Tettnanger: An aroma hop said to display noble characteristics and a slight spiciness, with aromas of black tea, pepper, and spice. Tradition: An aroma hop said to impart a harmonic bitterness, with aroma descriptor of floral, herbal, grassy, and fruity. I've used Saaz, East Kent Goldings, Styrian Goldings, and Tettnanger in the past. A mix of Czech Saaz and Styrian Goldings is my go-to combination for Belgian beers. There is something about East Kent Goldings I just don't like. I can't quite explain it, but beers containing very much of that hop variety just don't appeal to me. I can tolerate it in English styles, but generally dislike it elsewhere. More recently, I've found that blending a little East Kent Goldings with something else, like Styrian Goldings or Saaz, makes the East Kent Goldings bite more subtle and tolerable to me. Although I know Mandarina Bavaria isn't a common Tripel hop, but I think the fruitiness it imparts might work really well with the style. Blanc Soft Candi Sugar: No flavor addition to the beer. Clear Candi Sugar: No flavor addition to the beer. Corn Sugar: No flavor addition to the beer. Demerara Sugar: A type of cane sugar with a pale amber color. Has a toffee flavor and can be used in place of brown sugar. Golden Candi Syrup: Adds pronounced caramel and light fruit to Belgian styles. Honey (often Orange Blossom or Clover): Can knock the bitter edge off hops and add floral notes and aroma. Early in the boil contributes mostly fermentable sugar. Late in the boil or in the fermenter will contribute flavor and aroma. Light Brown Sugar: Lends subtle caramel notes to beer. White Table Sugar: There is a rumor that adding this to beer will lead to cider-like flavors, and there is also evidence to suggest that this is not the case. When I've used it, I've detected no off flavors. All of these will boost the alcohol content of a beer, lighten its body, and dry out some of the sweetness. I've used most of these in Tripels, as well as Turbinado sugar in a recent one. The clear candi sugars and corn sugar don't contribute anything I can detect to the flavor. The same for white table sugar as best I can tell. Because I'm wanting my Tripel to come out with less dryness than many of the examples of the style, I think I'll reduce the adjunct amount used. It's common in Belgian style recipes for sugars to make up 15% of the fermentables. I'm going to aim for a much lower percentage, and try to stick with a fermentable that will contribute something to the flavor. That means probably Golden Candi Syrup, Demerara Sugar, or Orange Blossom Honey... but not very much of any of them. I can imagine orange peel helping with the flavor profile I'm looking for, and probably coriander. I am less sure about pepper or grapefruit. I won't rule them out, though. I'm thinking a mix of bitter and sweet orange peel would be good, with a very small amount of coriander and perhaps some grains of paradise (which impart peppery flavors). I've not used the Ardennes strain in a Tripel. The author of that particular recipe claims that it delivers an ideal flavor complement to the beer, so I'll have to check it out. 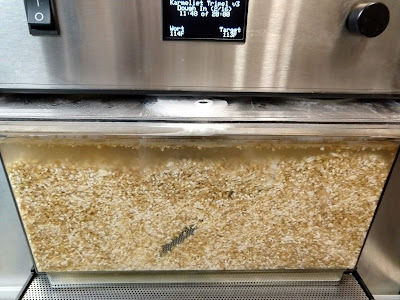 06/16/2018: The Zymatic appeared to get clogged at some point during the mash. 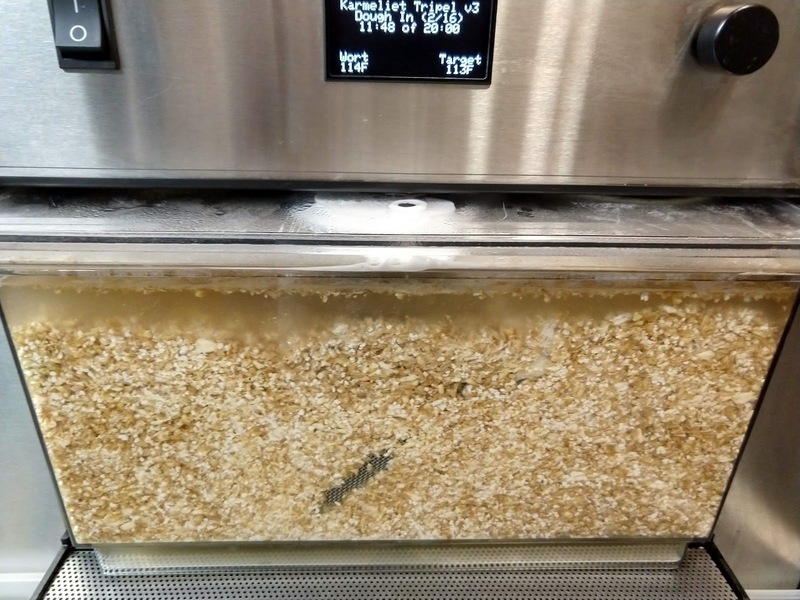 The grain bed didn't flood during mash out, and when it switched from "mash out" to "heat to boil" it halted with Error Code 1. When I tried to restart it, it got the same error. After that, I powered the Zymatic off and unplugged it briefly. After plugging it back in and powering it on, I was able to get it to begin the "heat to boil" stage. The Zymatic seemed to have trouble getting the wort up to boiling temperature. When it finally reached boiling, the temperature fluctuated for quite a while before stabilizing. I assume it must have cleared the blockage at that point as the rest of the brew finished without error. The gravity of the finished wort was low (1.071 versus the expected 1.083), as was the volume. I suspect that this was related to the possible blockage in the system, as it may have prevented full conversion of the wort. A few hours after pitching the yeast, I began seeing the gravity drop. Since the Ardennes strain is rated for temperatures between 65F and 76F, I'll be keeping an eye on it for the next few days. Since pitching, the wort has dropped from 73F to 70F. Gravity has dropped from 1.071 to 1.068 SG. This seems to indicate that the yeast is happy in its new home. Brew House Efficiency for this batch worked out to 48.8%, which is abysmal. The most likely cause is some blockage in the lines within the Zymatic that prevented it from being able to flow wort through the grain bed well during the mash. I ended up running multiple cleaning and rinsing cycles through it to ensure that the blockages are worked out of it. The brew I did the following week did not exhibit the issues seen with this batch, so hopefully a re-brew of this recipe in the future would yield a higher gravity. 06/17/2018: The yeast has been an impressive worker. Gravity has dropped from 1.071 SG to 1.038 in a little over 24 hours. That's 45% attenuation and 4.2% ABV in about 24 hours. Temperature dropped to a low of 70F overnight and is currently at 77F, just above the recommended top-end temperature for the yeast. I've read that it does fine in temperatures as high as 82F, so I'm going to let it free-ferment as long as it stays below that temperature. 06/18/2018: The yeast has continued to work its way through the fermentables. Gravity is down to 1.021 SG today and the temperature has dropped down to 71F. That is the final gravity I expected it to reach, so it's on target to finish as expected. A sample removed from the fermenter had a nice gold color, a fruity and slighly clove-like aroma, and a dry, fruity flavor to it. It could turn out quite well. 06/21/2018: The gravity is currently reading as 1.017 SG (77.1% attenuation and 7.1% ABV) and has been reading that figure since about 6am this morning. If that continues, as I suspect it will, I'll be treating it with gelatin and chilling it this weekend to brighten it up before bottling. 06/23/2018: The gravity is now reading 1.013 SG and 68F. It's held this gravity since about 5pm Friday, so it will need to hold that for a couple more days before I'm willing to move it to a refrigerator to brighten. 6/24/2018: I bloomed some gelatin in distilled water, then heated it to 158F before tossing it into the fermenter. I then moved the fermenter into my mini-fridge to brighten before bottling. At the time the beer went into the mini-fridge, the Tilt Hydrometer was reading 1.013 SG and 68F. When it comes out, I expect the gravity to read the same, but the temperature to be about 38F. I'm expecting to bottle it Thursday or Friday evening, depending on how clear it's gotten. 07/01/2018: The beer was bottled today, with four or five small carbonation drops per bottle (the number of drops used determined by the strength/thickness of the bottle). Yield was 23 bottles. A sample of the leftover flat beer had a good flavor. I'm hopeful the finished beer will as well. We'll know in a week or two. The bottles were placed in a 76F "hot box" to carbonate. 07/15/2018: The beer didn't carbonate at first, and had to be flipped upside down daily for a few days. Today it was clearly carbonated well enough to serve, so I removed it from the hot box in preparation for labeling.